<-- Last year I went to Tasmania to work for a week. 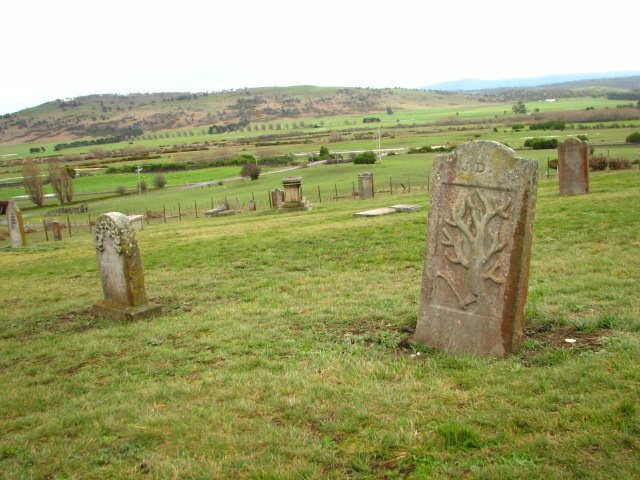 I drove down the middle, which I hadn't done before, and came across this cemetery - the cemetery of Tasmania's first female prison. 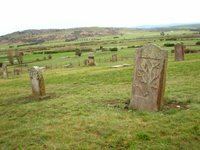 It was filled with headstones for babies - strange, as there were no men in the prison. Except the warders, of course. I've locked myself out of the house. Everytime I do this I vow I'm going to have another key cut and bury it in the bush somewhere. Have I done that? Of course not. The first time, I climbed in through the bathroom window. The second time, I'd left the kitchen window open. No luck with either tonight. I had planned to lounge about, finish my novel - The Jane Austen Book Club, which isn't grabbing me as much as i thought it might. I keep getting the characters mixed up. But Lovergirl isn't home until about 9pm tonight; she's running a group for parents of teenagers with e*a*t*i*n*g d*i*s*o*r*d*e*r*s, or some such. So I can't get in 'til then. And I thought I could update you on a few things. For those who read this blog solely to keep abreast of our family planning (another phrase that could be dangerous in the hands of a search engine), I know I've been slack. Here's the latest. We're doing IVF this month. This'll be Lovergirl's second attempt. It's been much harder this month; I'm really getting tired. Tired of driving to Brisbane, back and forth, leaving the bush house after work, getting up there at 8, seeing the clinic at 7am then driving back in time for a late start to work the next day. Tired of missing out on social occasions, of not really living here because we can't plan ahead in case it clashes with a test or an ovulation or a count of follicles. Tired of haemorrhaging money on doctors, naturopaths, supplements, acupuncturists, Chinese herbalists. Tired of talking about temperatures and wee-sticks and ferning patterns on home-kit microscopes. Tired of taking drugs and snorting drugs and injecting drugs. And really really really tired of having my future on hold, of not planning anything because this may come off. For people who have my phone number: I do not want to talk about this. That's why I blog it. So you see I can keep my little problem in perspective. Nice middle class girl in bush idyll, suddenly surprised by not getting everything I want. Anyway, I was curious to find out what others had done with their lives and how they felt about coming to a reunion. James, who was going off to be a fighter pilot with the RAAF. The astonishingly smart but unfortunately complexioned Heinrich, who I imagine has blossomed into a wealthy, handsome neurosurgeon. Long-legged school captain Kathryn and her best friend Leeza, who, unfairly, were not only gorgeous but smart and excellent at netball, swimming and cross-country running. And surely at least one or two of the boys, statistically speaking, must be big ole poofters? Who? Who? Anyway, I'm not going. So that was a waste of two weeks of intense self-denial. I'll stick with the PhD though - might as well. I'm so glad you do this blog - even when we have trouble hooking up on the phone, I still get to know what is going on in your busy life / interesting mind. And thanks for the tip off re: not asking about baby issues. I'm sure I think like a lot of your friends 'She must be sick to death of talking about it, but I'm a good friend so surely she wants to discuss it with me'. Or 'If I don't ask she'll think I'm not interested'. Very disappointed not to be catching up with you this weeknd, so you'd better plan another trip down soon! Or I'll come up and see you agian, I think my chakras need realigning. PS And at least when you were locked out of the house you didn't have to worry about not being able to get to the loo! it's just that I don't want to sound like a whinger - which possibly I do, on this blog - it's an infinite rabbit hole of quite banal ruminations. I'd rather try and contain the amount of airspace the state of our respective uteruses (uteri?) take up in my friendships. And my relationship too - but that's a bit more difficult.